It used to be that if a fifth-grader at Fancy Farm Elementary was struggling with a subject such as math or social studies, a few weeks could pass before her parents saw the impact on her report card. That’s just one of the ways educators in West Kentucky and Tennessee are using WK&T’s broadband to connect with students of all ages. At Fancy Farm, Throgmorton says students are on computers four days a week. In addition to educational videos, students take virtual field trips to places like the St. Louis Science Center, the Kentucky Capitol in Frankfort and the monuments in Washington, D.C.
ave that we don’t,” says Throgmorton. Broadband connectivity is a major learning tool for the students and faculty at Fancy Farm Elementary. At West Kentucky Community and Technical College in Paducah, Kentucky, online classes are becoming more and more popular. “There are several degrees that can be done completely online,” says Sandy Tucker, the Director of Online Student Services. WKCTC offers everything from writing to chemistry labs online. The labs come equipped with virtual chemicals students can manipulate. “The chemicals will react to what they’re mixing so they can see what happens,” says Rebecca Jones, a distance learning specialist. Other classes are a mix of lecture videos, reading, writing and online quizzes. One of the more popular formats are the “Learn On Demand” classes. Students can start the classes whenever they like, but the work must be completed within 15 weeks. The format was designed for WKCTC’s marine technology degree, because it gives students who work on tow boats the flexibility they need to complete their degree and keep their job on the rivers. Students can schedule around trips, or align their coursework so they can complete assignments or study while in port. WKCTC draws students from the entire region, including many served by WK&T’s fiber. With the help of a fast broadband connection, these students are able to attend online classes, get their degree and improve the quality of life for themselves and their family. Accessing these online offerings would be impossible without broadband. “You just cannot function in class without high-speed Internet,” says Connie Heflin, director of online learning at WKCTC. 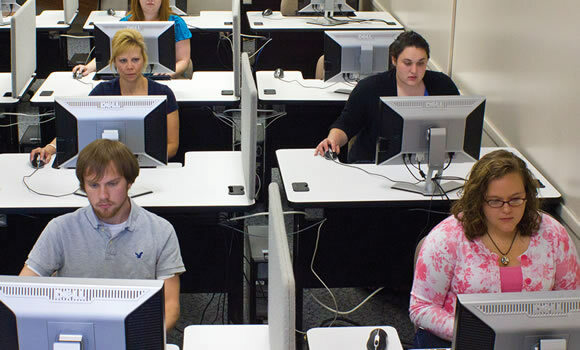 Broadband connects area residents with a number of training program offered via distance learning by West Kentucky Community and Technical College.